Over Memorial Day weekend I took a trip with my friend Nancie to Merchant’s Millpond State Park in Gates County, N.C. Neither of us had ever been there before but had heard that it was a beautiful spot, less than an hour’s drive from Chesapeake. 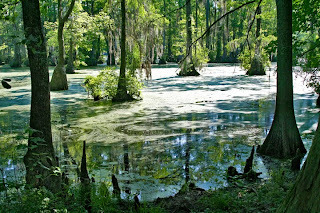 We heard right; this park is gorgeous, and exactly what you picture when you think of a “Southern swamp.” To get there you go south on Highway 17 into North Carolina, then before you get to Elizabeth City you turn right on Highway 158 westbound towards Sunbury. A few miles after the intersection with Highway 32, you’ll see the entrance to Merchant’s Millpond. The park covers more than 3200 acres in total. It has a visitor’ s center, a campsite and picnic area, a fishing dock, canoes and a few other amenities, making it a great spot for a family outing. But the part that we were interested was the foot trail that meanders through the woods that surround the 760-acre millpond, which are rich with old growth bald cypress, and tupelo gum trees draped with Spanish moss. It is the kind of place that inspires reverence and astonishment at a natural place not yet touched by man. Well, not touched too much; although civilization is close by, you can still imagine for a few moments that you are in the forest primeval. Although it was absolutely beautiful, we didn’t see the same numbers of insects and birds here that I usually see at The Dismal Swamp. This surprised me because the two swamps are so close together in distance. Maybe this was because we were there on a particularly hot day, or because it was later in the year than my visits to the Dismal Swamp, but I suspect it’s also because the two places have very different kinds of vegetation and ecosystems, which of course determines the abundance of different animal species. The state line between Virginia and North Carolina is the boundary where the environment changes ever so slightly, but enough that American Alligators do not thrive north of that boundary. Merchant’s Millpond is the northernmost extent of the alligator’s habitat; the ranger at the park told us that there are only about four alligators in the park, but they are in fact a permanent and sustainable population. Alligators do occasionally wander north into Virginia and into the Dismal Swamp, but they do not survive there or reproduce because there are just a few more cold days during the year than there are south of the state line. 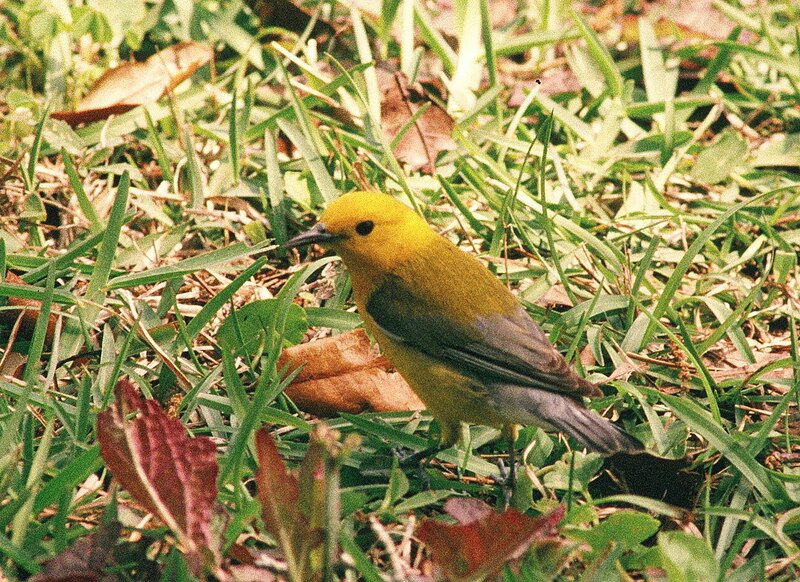 Such small differences can have an enormous impact on wildlife. 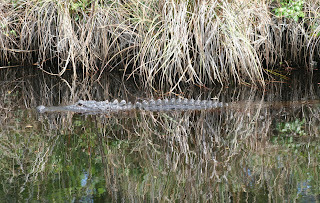 I did see an alligator a couple of years ago (above) as I was driving west from Manteo (N.C.) on Highway 64. 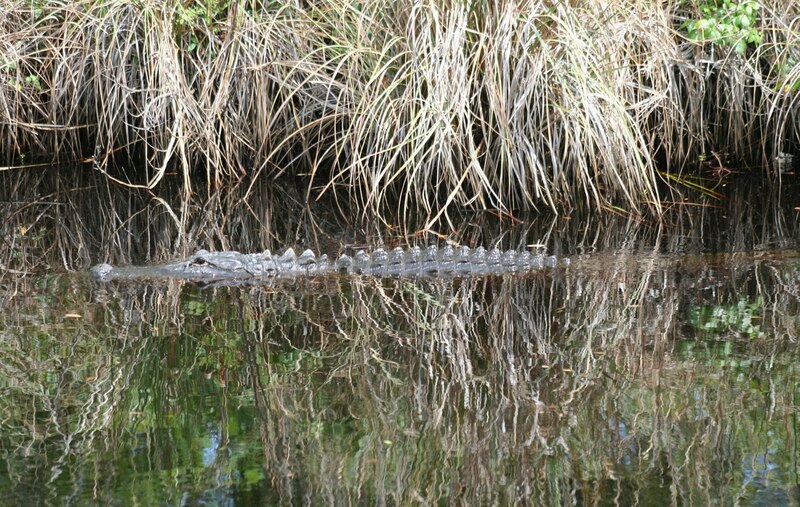 It was in the water right along the highway, and as I zipped past it, my brain registered what I saw, and I turned around and went back to make sure I hadn’t hallucinated or mistaken a log for an alligator. Here’s his photo; this guy was a good six feet long, and I was surprised to learn they occurred this far north. 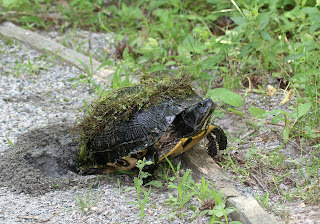 Back at Merchant’s Millpond, we saw no alligators, but one of the highlights for us was this Yellow-bellied Slider that was about to lay eggs in a hole she dug right on the trail. Look at the mosses that are attached to her shell; it’s like she decorated herself for the occasion! 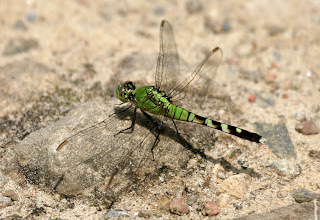 We were glad when she left before laying her eggs, because they would not have survived there with all the foot traffic. 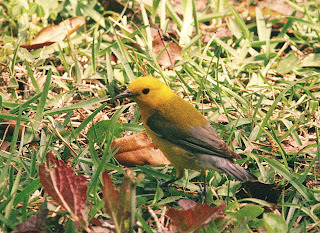 We did see a handful of birds (Prothonotary Warblers being the most common; here’s one I photographed in Alabama), and a few dragonflies and butterflies , but I wasn’t able to get many other photographs. So the rest of the pictures I’m going to share with you (below) were taken at the Dismal Swamp this year in the latter half of May. I’m sure that all these species do occur at Merchant’s Millpond as well; they just weren’t there on the same day we were. The dragonfly below is a Swamp Darner, a species in the Darner family (think darning needle). 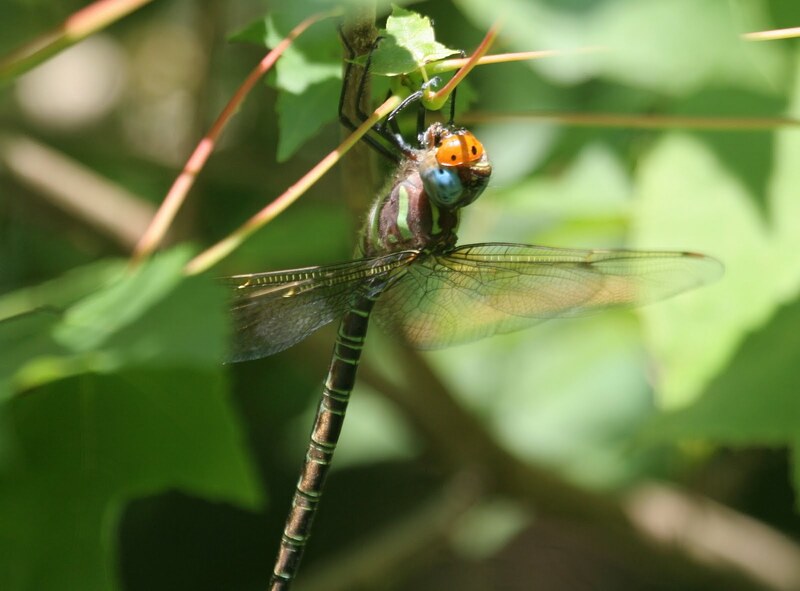 These are abundant in the Dismal Swamp now, and are constantly in motion overhead. They are difficult to photograph because they don’t land often, and when they do they perch vertically, usually on a tree branch in the woods where you can’t get to them. This one is eating a ladybug. 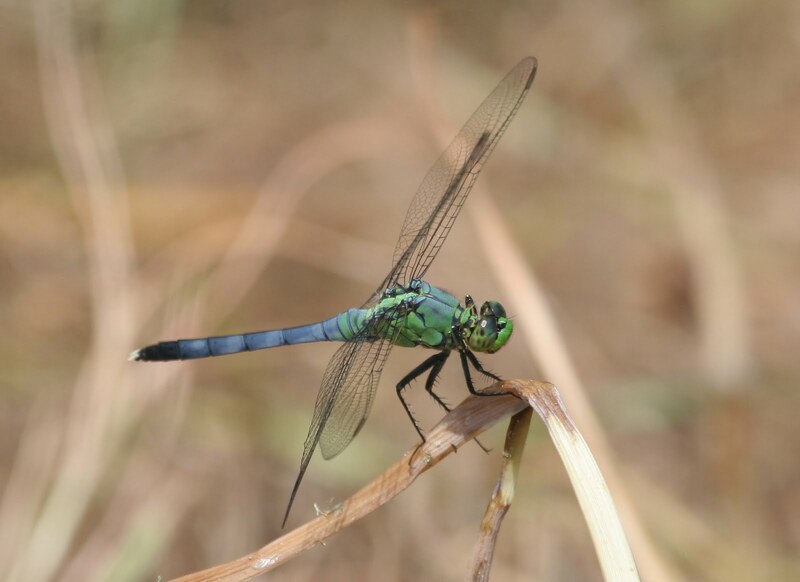 Darners are our largest dragonflies; the smallest Odonata are the damselflies, those tiny needle-like things that usually hover close to the ground. They are difficult to photograph because of their size, but if you can get a clear photo you can see all the minute markings that distinguish one species from another. 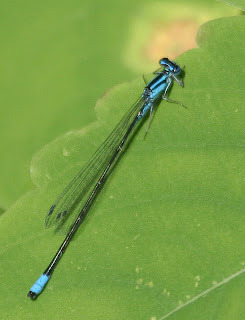 The damselfly below is one of the “bluets,” a Turquoise Bluet about 1 inch long. 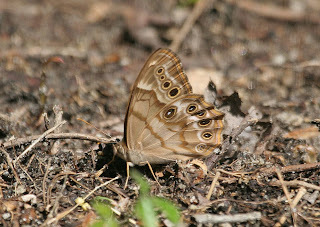 This was the first of this species I’ve ever seen, and it was along Washington Ditch at the Dismal Swamp on May 14. 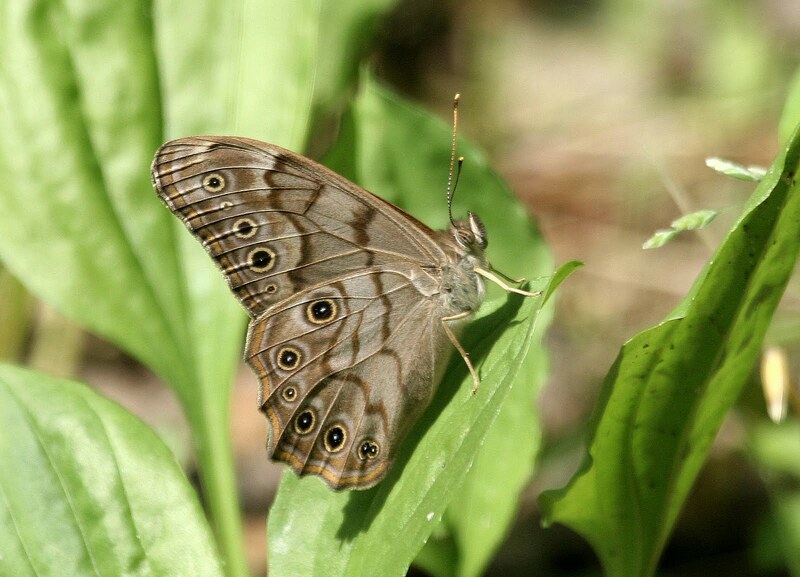 Back to butterflies — Two kinds of Pearly-eyes occur in the Dismal Swamp, the Southern and the Creole Pearly-eyes. 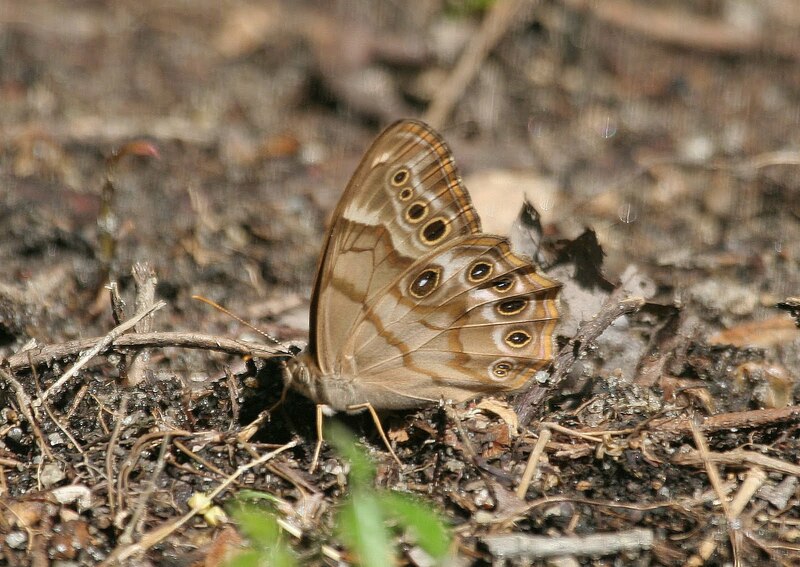 (A third kind, the Northern Pearly-eye, occurs to the west of us in the Piedmont and the mountains). I took these photos at the Swamp on May 14; the Creole is on the left and the Southern is on the right. See if you can pick out some of the differences between the two. (Remember, you can click on any of these pictures to get an enlarged version for better viewing). I’ll end this posting with the best picture I’ve ever managed to take of an Eastern Comma. 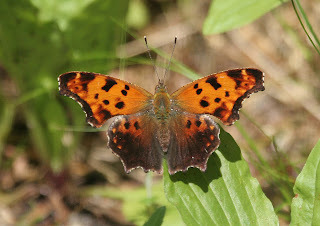 I’ve mentioned the Comma in an earlier post; it is named for the small white “comma” mark that appears on its underwing. Like the Pearly-eyes, it does not usually appear in suburban gardens, but is a common breeder in The Swamp. We have these wonderful southern swamps right here in our own back yards. Take some time to visit them, discover their beauty, and observe life you didn’t know existed. Heck, try to take a picture of what you see! It will only enrich your life.